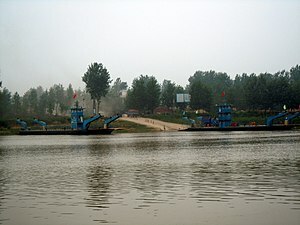 The Huai River (Cheenese: 淮河; pinyin: Huái Hé) is a major river in Cheenae. The Huai River is locatit aboot mid-wye atween the Yellae River an Yangtze River, the twa lairgest rivers in Cheenae, an lik them runs frae wast tae east. Houiver, the Huai River daes nae flow aw the wye tae the sea, makin it notoriously vulnerable tae floodin. The Huai River-Qin Muntains line is generally regardit as the geographical dividin line atween North Cheenae an Sooth Cheenae. This line approximates the 0 degree Januar isotherm an the 800 mm isohyet in Cheenae. The Huai river haes a lenth o 1,078 kilometers an a drainage aurie o 174,000 square kilometers. The Huai River oreeginates in Tongbai Muntain in Henan province. It flows throu soothren Henan, northren Anhui, an northren Jiangsu, enterin the Yangtze River at Jiangdu, Yangzhou. Heestorically, the Huai River entered the Yellae Sea at Yuntiguan ("Escalade Pass") throu a broad an level lawer coorse. It wis lang uised tae irrigate the surroondin farmlands, an wis the centre o an extensive network o canals an tributaries. Beginnin in 1194, houiver, the Yellae River tae the north repeatitly chynged its coorse soothwards tae run intae the Huai River. The resultin siltin wis sae hivy that efter the Yellae River chynged back tae its northerly course for the maist recent time in 1897, the geografie o the Huai River basin wis chynged signeeficantly bi the creation o new heich lands, lochs, an the biggit-up silt o the Yellae River's heestorical soothren coorse. As a result, watter frae the midsection o the river coud nae easily flow intae the lawer section, while watter in the lawer section coud nae find an ootlet tae the sea. The problem worsened in the Seicont Warld War, when the Chiang Kai-shek govrenment, in an attempt tae check the pace o the Japanese invasion, fluidit the lawer Huai basin bi openin the Yellae River's soothren levee. The main stem o the Yellae River flowed throu the levee breach for the next nine years, further disruptin the Huai river seestem. The result o thir chynges wis that watter frae the Huai River puiled up intae Loch Hongze, an then ran soothwards taewards the Yangtze River. Major an minor fluids occurred frequently, wi the aurie sufferin drouchts in atween fluids. In the 450 years tae 1950, the Huai River saw, on average, 94 major fluids per century. Attempts tae solve the Huai River's problems hae focussed on biggin ootlets for the Huai River intae the Yangtze River an the sea. Currently, the major pairt o the river's flow enters the Yangtze River via Loch Hongze. The North Jiangsu Irrigation Main Channel an aa diverts some o its watter alang its auld historical coorse tae the sea, an is planned tae be upgradit wi a new parallel channel. Several umwhile tributaries an aa cairy some watter tae the sea. This page wis last eeditit on 18 Mey 2018, at 03:25.